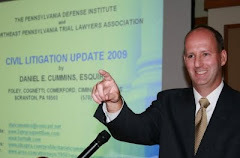 In what appears to a be case of first impression in that county, Judge Jacqueline L. Russell of the Schuylkill County Court of Common Pleas entered a November 5, 2010 Order sustained the Preliminary Objections of the tortfeasor Defendant in the post-Koken case of Corridoni v. Temple and MetLife Auto & Home et.al., No. S-1470-2010 (Schuylkill Co. Nov. 5, 2010, Russell, J. ), severing the claims against the tortfeasor from the claims asserted against the insurance company Defendants for UIM benefits. In her Order, Judge Russell stated that “[t]his Court does not find it appropriate to allow Plaintiff’s tort cause of action in negligence against [the tortfeasors] to be joined in the same Complaint with Plaintiff’s claims that he is entitled to damages in contract against his insurer(s) relative to the alleged underinsured status of Temple.” [bracket inserted]. The judge also noted that, with respect to the Plaintiff’s argument that a severance of the claims would result in a duplication of litigation efforts, the Court anticipated that the parties would be able to cooperate to avoid such duplicative efforts. Judge Russell further noted that, if the parties were not able to cooperate in this regard, the Court, upon proper motion, may direct the consolidation of the separate actions for discovery purposes. Judge Russell further ordered that the Plaintiff should file an Amended Complaint on the claims against the tortfeasor under one docket number and should file a separate Complaint against the insurance company Defendants under a second docket number, with all costs to be paid for by the Plaintiffs. I thank the prevailing defense attorney, Joseph F. Murphy, of the Harrisburg office of Forry Ullman for forwarding this case to my attention. I will update the Post-Koken Scorecard in the near future to add the recent cases noted.